File replication backup for files and folders. Real-time data replication and backup software. Plug2Sync and Backup is an easy to use real-time file replication backup software. Apart from its capability to synchronize files and folders, one of the main use cases is related to real-time data replication and USB backup for files and folders. Using Plug2Sync and Backup you are able to back up data from your computer, laptop or netbook to any removable storage device connected via USB. All you have to do is plug in the USB storage device where you want your data to be backed up, or you can even choose just a local drive, and select which files and folders to back up. After you press the button ‘Sync Now’ your data starts backing up and the files and folders that you have selected go through a file replication backup process. This means that all files and folder structure that you have chosen to back up are replicated on your external hard drive, flash drive or any other chosen USB device. One of the things that makes Plug2Sync and Backup such a unique backup software is its real-time backup capability. This means is that while you keep your USB device plugged in, the data that has been backed up will be synchronized with the original data in case any changes are made. In this way you can always be sure that the backups are as up to date as possible. Automatic USB Backup – plug the removable device and back up data automatically. Flash drive backups, external HDD backups and in general backups that use USB devices usually require a lot of attention because they need to be configured each time. Plug2Sync and Backup is different and can do all the work for you. All you need to do is configure it once and then each time when you plug in the same flash drive, external hard drive or any other USB device the backup process will start automatically. Because of the real-time backup capability, Plug2Sync and Backup can recognize the files that have been modified from the last backup and then update them while skipping all the other files that remain the same. This helps maintain a good level of performance for your pc, laptop or netbook by avoiding unnecessary usage of resources. 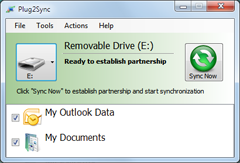 Backing up data to your flash drive, external hard drive or any other removable devices has never been so easy and simple as it is now when using Plug2Sync and Backup. Backup bookmarks automatically. Real-time bookmarks backup keeps your data safe. Another important case that this sync and backup software addresses is related to bookmarks and favorites. It is possible not only to sync bookmarks across computers, but also to backup bookmarks and favorites to a flash drive or other USB devices. 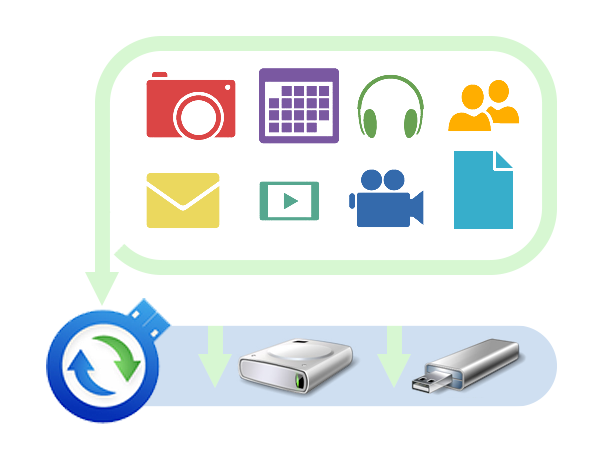 Plug2Sync and Backup uses a real-time and automatic bookmarks backup process. During the time that your USB flash drive, or other preferred USB device, is connected to your computer, our data replication backup software will back up bookmarks from your computer to the USB device automatically and all your latest changes will be saved. This makes it easy to restore your bookmarks and favorites on any computer and makes sharing them also easy.